It is common knowledge that Small and Medium Enterprises (SMEs) play a vital role in the development of any economy. According to the World Bank, SMEs contribute up to 60%of employment opportunities and up to 40% to the national Gross Domestic Product (GDP). Yet, access to funding remains a critical drag on the performance of many of these businesses. The stark reality is this: without access to patient funding, many of these businesses will struggle to stay afloat. 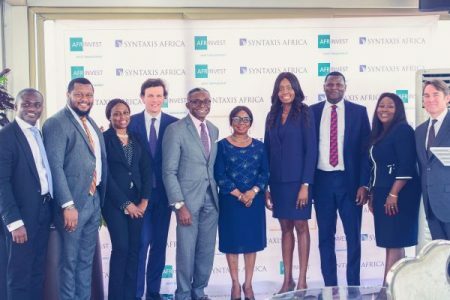 Syntaxis Capital Africa has partnered with Afrinvest Asset Management Limited to launch the Syntaxis Nigeria Growth Fund, a N12 billion private equity fund to meet the funding needs of SMEs in Nigeria and selected countries in Sub-Saharan Africa. This will cover a variety of sectors including manufacturing, agriprocessing, healthcare, education and non-banking financial services. The fund was launched on Thursday, January 10, 2019 in Abuja at the newly commissioned Wells Carlton Hotel and Luxury Apartments in the presence of key capital market stakeholders including the Acting Director General, Securities and Exchange Commission, Mary Uduk. Speaking at the event, the Group Managing Director of Afrinvest, Ike Chioke, indicated that, the focus of the fund is on deepening and widening financing alternatives for SMEs by providing patient capital. The fund provides a viable option for SMEs who are looking for sustainable growth capital. Partner and Managing Director, Syntaxis Capital Africa, Adesuwa Okunbo while delivering the keynote address spoke on the differentiating factors of the fund said, “we see the fund as a vehicle for rapid economic growth and development in the countries we invest in. By providing not only access to patient growth capital to SMEs, but also combining that with capacity building and operational expertise, we are giving businesses the ability to scale their activities, which will in turn will increase productivity, create new jobs and generate taxes for the government. Syntaxis Capital Africa, the sponsor of the fund, has team members with a 30-year track record of successfully managing private equity funds with experienced local teams, having raised up to US$300 million from global institutional investors and deploying successful private equity funds in other emerging markets. Afrinvest Asset Management Limited, the fund manager, is licensed by the Securities and Exchange Commission (SEC), Nigeria, as a portfolio manager with several listed funds including the Nigeria International Debt Fund; as well as the Afrinvest Equity Fund.